Underappreciated fruits and vegetables will always have a special place in my heart. Rhubarb, nettles, quince: all these things, so tasty when cooked, used to be very popular until they got shouldered aside by easier pleasures that didn't sting the unwary picker into welts, or weren't so sour or astringent at first bite as to make you wince. Artichokes' dip-scooping leaves were probably its saving grace. But for its use as a nifty delivery system for melted butter and lemon mayonnaise, it would be a forgotten thistle today. Apricots, while more accessible, still have a certain forgotten-fruit quality to them. Just as quince gets described as apple's tough, weird older sister, so apricots are often just a placeholder for peach-lovers, something sweet and orange with a pit that will do until the real goodies come along. But apricots are good for cooking in a way that peaches aren't, their flavor intensifying into an ineffable tangy sweetness that leans just right against a crumbly, buttery short crust or a piece of whole-grain toast, especially one spread with mild fresh chevre. Too often, though, all that the marketplace offers is the big bland Patterson, so smooth-skinned, so bright, so uniform and so utterly dull. What you really want, especially for jam, are Blenheims, also called Royal Blenheims. You have to trust in these, because they're not so pretty. Mostly they're small, often green-shouldered, often freckly. At peak ripeness, they're almost deliquescent, their pulp turning to jam right inside the skin. But, oh, what juicy, sticky-dripping flavor! Slurpy-good right off the tree, they're sublime for jam. 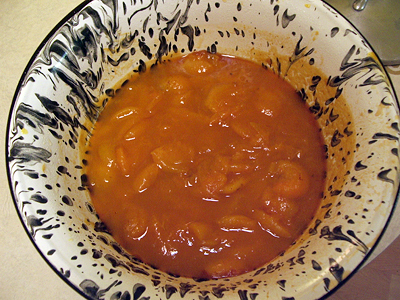 I like to use the same overnight-sugar macerating technique as for strawberries, although these apricots don't throw off enough liquid to make straining necessary. Instead, they subside gracefully into a pool of satiny slush that's part pulp, part skin, part juice, and all divine. Being wildly uncommercial—too small, too funny-looking, too mushy, too short a season—Blenheims have to be hunted out, either from soft-hearted orchardists or friends with an old tree in the backyard. Everything Under the Sun (the folks with the "Sampling is Mandatory-We're Watching!" sign) at the Ferry Plaza Farmers' Market had them last week, and probably this week, but not for much longer. Carpe diem! Get out your jars! Of all the jams I make, this one remains my favorite. Letting the fruit and sugar macerate together before cooking mellows the sweetness and helps thickens the final product without the need for long cooking. This preserves the fruit's naturally vivid flavor and color. Yield: 4 to 5 8-oz jars. 1. Halve apricots and pop out pits. Cut fruit into quarters if large. Toss apricots, sugar, and lemon juice together in a glass or ceramic bowl. Cover with a towel and set aside for several hours at room temperature, or overnight in the refrigerator. Stir occasionally to help the sugar dissolve evenly, if you feel like it. 2. When all the sugar has been dissolved, pour the mixture into a wide, heavy-bottomed nonreactive pot and bring to a boil over medium heat. Reduce heat to low and simmer 10 minutes, stirring gently but frequently. Cook for another 8 minutes, until the fruit looks translucent and is beginning to break down. It's easy to scorch it at this stage, so stir frequently and don't wander off. 3. Pour mixture back into the bowl, let cool, then cover with a towel and set aside at room temperature for at least six hours, or overnight in the refrigerator. 4. Return fruit mixture to the large pot. Over low heat, bring to a simmer, stirring frequently. Cook for another 10-12 minutes, until fruit has mostly broken down and juices look syrupy. Scoop a small amount of juice onto a clean metal spoon. Tip the spoon sideways and let juice run off the edge. When juice has reached the jelly point, the last few drops will look thicker and run together into one viscous drop. Remove from heat. Ladle into clean, sterilized jars. 5. Set jars on a clean towel and do not touch or move them until they are completely cool. If you're using canning jars, listen for the slurpy sucking pop of the jars vacuum-sealing. Sealed jars will keep up to 1 year in a cool, dry place. If jar isn't sealed, store in fridge and eat within 2-3 weeks.